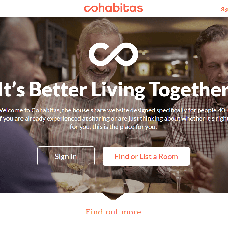 Cohabitas is a house share website designed specifically for people aged 40 and above. A house or flat share with people other than a partner or in a traditional family is common-place for younger people, but it’s also a great alternative to living alone when you're older. Not only can you save money on rent and have more to spend on going out or other things, you can also have companionship and meet new people. But if you’re aged 40+, then finding someone like-minded to share with can be difficult. Young professionals and students do not make the best house mates when you're older and a little more discerning about where you live. Or maybe you’re the owner of a larger house than you need now. With rooms to rent you could be considering having a lodger in the spare room as an alternative to downsizing. In this case finding the right sort of person to share with is an important part of your decision. Rooms, flats and houses to rent - suitable for the community of mature house sharers.